I was contemplating for hours whether or not to ask the big question that could forever change my life. Even though so many friends and family were supportive of me asking the question, I was still feeling reluctant. I had never done this before so I was a little anxious about it. I decided to just sleep off the contemplation and figure it out the next morning. The next morning came along. I woke up and was still puzzled. I only had a few hours to decide what to do with my future. Somehow, I came to a conclusion, “Go big or go home.” I decided to go big. YOLO. I quickly but safely went over to Target to buy a poster and some sharpies. Then at home, I printed out enlarged faces of his and mine. That was probably the hardest part to figure out but luckily my friend, Kevin, was able to help me remotely. I printed out our faces under Fast Draft to save some ink but that was kind of a bad idea because both of our faces got faded. Well, my face was faded but still recognizable. His face on the other hand was all purple and discolored basically. I had to reprint a portion of his face. Once the printing was all done, I had to cut and put the pieces of our faces together. Then I had to write the big question on the poster but according to my friends, asking the question wasn’t forward enough. They suggested to turn the question into a statement and I did just that. Again, go big or go home. Right underneath the bold statement, I glued our faces onto the poster. Then I was finally off to go do my thing. Before entering through the doors that was going to determine my fate, I proudly took a picture of my last minute masterpiece in front of the venue. As I entered, someone stopped me from moving forward. Someone stopped me because they were jealous of what I had made. Someone didn’t believe in fate. I am somewhat kidding about that last paragraph. Ok, but enough of me being dramatic! I’m not a dramatic person ever so that was kind of fun. As you can see, I made a poster for Jeremy Lin. I decided to have fun with this because I’ve never made a poster for any games or concerts. 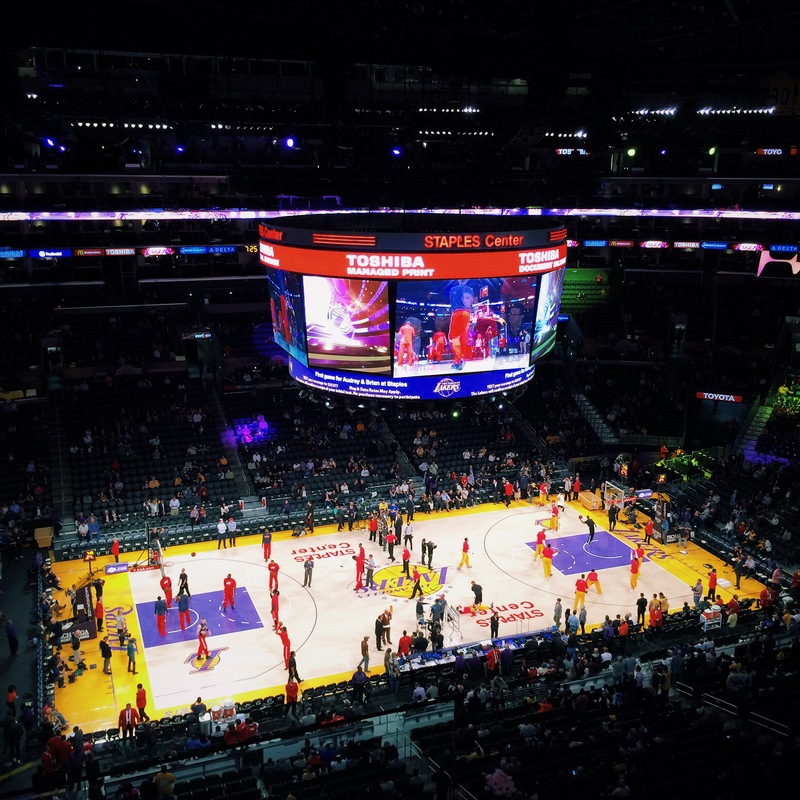 I went to my third Lakers game ever and this time it was against the Washington Wizards. The first two times that I’ve gone, they were both against Houston Rockets. I ended up not being able to take my poster into Staples Center. The security guard said it was too big and the color was too distracting. In minutes, I had to throw away that fun cute looking poster. It was sad for a good 10 minutes but then I got over it because the Lakers were playing well in the first half of the game. In the last quarter, things started spiral down for the Lakers. Unfortunately, they ended up losing against the Wizards by 6 points! Some blame that they lost because Jeremy Lin wasn’t able to see my poster. I may have to agree on that. I’m sorry Lakers for the loss but it wasn’t completely my fault. I hope you understand. Though Jeremy Lin was never able to see my VaLINtine poster and though the Lakers lost, all in all it was good to see the Lakers play live at Staples Center. It’s always different when you’re watching the game in person than at home. The ambiance is much more exciting when you’re sitting next to true Lakers fans. Thanks Ann, John, and Derek for inviting me to watch the game with you guys! Next time, let’s try to get free tacos! Go Lakers! ← The Hills Are Alive!